I don’t remember where I saw this first, but I really liked the look and the simplicity of it. So I gave it a whirl and I’m very happy. In the beginning, there was a basic nine patch block. Next, I boldly cut it into quarters. Then, I rotated and rearranged until I was pleased with the layout. Finally, I sewed the quarter sections together, and voila! 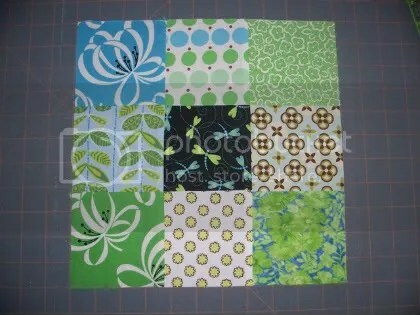 A very pretty quilt block. I have about 9 more blocks partially pieced into nine-patches. I’m still deciding whether to do each final block the same or try to randomize the arrangement. I’m also still deciding why I’m doing this in the first place. I could make it a baby quilt for our new little one, but maybe there are too many floral prints for a baby boy? 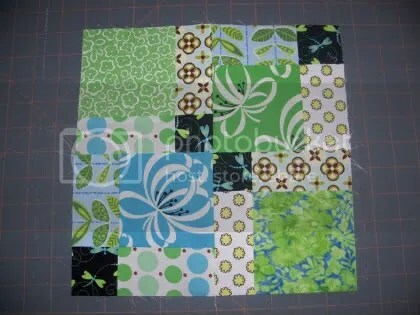 Or maybe a lap quilt for me? Nothing bigger than that, though…or it’ll never get done. BTW, the fabrics are mostly Katie Jump Rope and Ginger Blossom, with a few random prints from my stash thrown in to get a scrappy look. That is a great idea! I’m going to keep this in mind for a future project. It certainly gives an already cute nine patch that extra little zing! That looks great! Thanks for sharing that idea. The more I sew, the more fabric scraps I accumulate. I’m fixing to make a lap quilt in time for cooler weather (which means I have until mid December since I live in the Southeast US, heh)! Why oh why can’t you live near me!!!! I love to sew and have no one to inspire me or motivate me. I have such a messy sewing room that I just can’t start myself doing anything! I have about 5 huge totes with wonderful fabrics. Thank you for posting all your beautiful projects, I am going to start on my sewing room TODAY! Thanks again for the wonderful inspiration. I love this! It looks superb. I may have to copy! And a nice, clever way to get a complicated look without all the hassle. I always pity a novice sewer who tries to tackle a project that I find confusing..what must they think? I love that disappearing nine patch! And I couldn’t agree with you more about loving the Katie Jump Rope fabrics. I actually just orders a whole bunch more for a commissioned quilt. You’ve seen Deynse Schmidt’s new home dec. weight line with many of these same patterns, right? It’s beautiful! I’m working on a disappearing 9 patch quilt myself, using a variety of 30’s prints. I’ve seen several of these quilts, but none done with fabrics like you’ve chosen. I really like them! Nice blog, too! 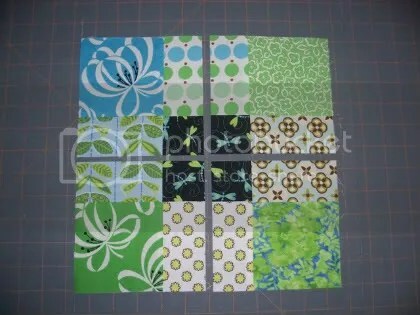 I love this creative but simple way to rearrange the nine patch pattern….AWESOME IDEA! I am also working on one myself! I am using total scrappy fabrics and have some of these same prints in mine! :) Love these prints. That is totally cool! I have got to try that. What a great way to jazz up a plain old 9-patch. Hello, I'm Rebecka, owner of Blueflower Treasures. I'm a busy mom to six wonderful children and sewing is my creative outlet. Thanks for visiting my blog and I hope you will leave a comment and come back soon!